It must be a fairly new product. The screener at SFO pulled it out to verify the size printed on the tube. If the TSA were half as responsive to the needs of travelers, the idiocy of the liquid/gel limitations would go away. More jeers for the TSA for a stupid plan for special laptop cases that may or may not require you to take your laptop out of your bag when going through security. Manufacturers can make bags that may or not meet the guidelines. Bags with zippers, buckles or pockets that can hold things like cables or power adapters likely won’t. As near as I can tell, a laptop condom is the only thing that will for sure meet the guidelines. The only way to know for sure is to send your new laptop bag through the X-Ray machine and see if the screener makes you take the laptop out. This entry was posted in random, terrorism, travel. Bookmark the permalink. It’s been driving me crazy that I can’t find these in the UK and I buy a bunch every time I’m home (the US). 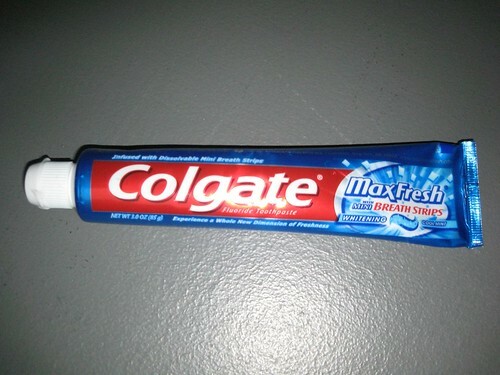 However, it is not a new product and it is not limitd to Colgate. Travel toothpaste, shampoo, etc. have been around for many years and are available at most stores that sell toiletries (CVS, Walgreens, Target and more).